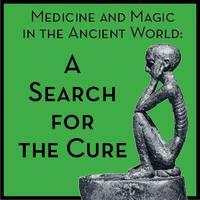 In October at the Oriental Institute, several professors participated in the lecture series “Medicine and Magic in the Ancient World, A Search for the Cure”, which sought to explore the connection between the physical and the psychological aspect of healing within ancient Mesopotamia, Egypt, and Greece. Robert Ritner, Professor in Egyptology, opened the series with his talk titled “The Theory and Practice of Medicine and Magic in Ancient Egypt”, Christopher Faraone, the Frank Curtis Springer and Gertrude Melcher Springer Professor in the Humanities, and the College, and Elizabeth Asmis, Professor in Classics, presented “Medical Healing in Ancient Greece”. Walter Farber, Professor of Assyriology, discussed how people came to understand and fight against contagious diseases in his lecture titled “Diseases and Epidemics in Ancient Mesopotamia: Medical Conceptualization and Responses”, while Robert Biggs, Professor Emeritus in Assyriology, focused on Mesopotamian religious practitioners and their approach to illness and misfortune in his talk “Religious and Magical Elements in Babylonian Medical Practice.” The series closed on October 27 with a presentation by John Wee, a postdoctoral scholar in Near Eastern Languages and Civilizations, titled “Mesopotamian Texts and the Knowledge Assumptions of Medical Diagnosis”. To find out about upcoming lectures at the Oriental Institute, please visit their Events & Programs web page. Posted in Uncategorized. Tagged with Faculty, Oriental Institute.